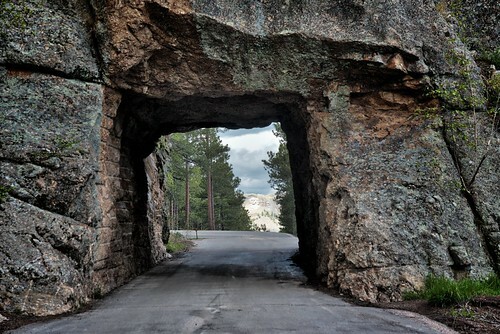 I'd seen hints of Mount Rushmore from different points along U.S. Route 16A in the Black Hills National Forest on the winding curves of that highway a few times but never had a chance at that point to really pulloff. Here though, it was all lined up to use the Scovel Johnson Tunnel as a portal to view it off in the distance. Composing the image was simple enough in lining myself up. Metering was a lot more trickier, given the large dynamic range. Nearby and through the tunnel were much more in shadows and even partially covered by the nearby forest of trees. Mount Rushmore though was caught in a bright light from the late morning sun. I chose to meter off the former and then adjusted the shutter speed to best capture light across the entire image. I later brought the RAW/NEF image into Aurora HDR Pro and used that to better work with the dynamic range capture to produce a HDR image from single RAW one.